I was out of town and missed the first week at Silverstone, but I participated in several of the Red Bull Ring races this past week and had a blast. I'm consistently in the high 1:57 to low 1:59 range on my RBR laps and I'm running with the bare stock setup. The aliens are hitting an occasional 1:53. Being a mod car, there aren't any resources out there (that I have found at least) for setups nor has there been any discussion on the forum. Does anybody have a setup they are willing to share? 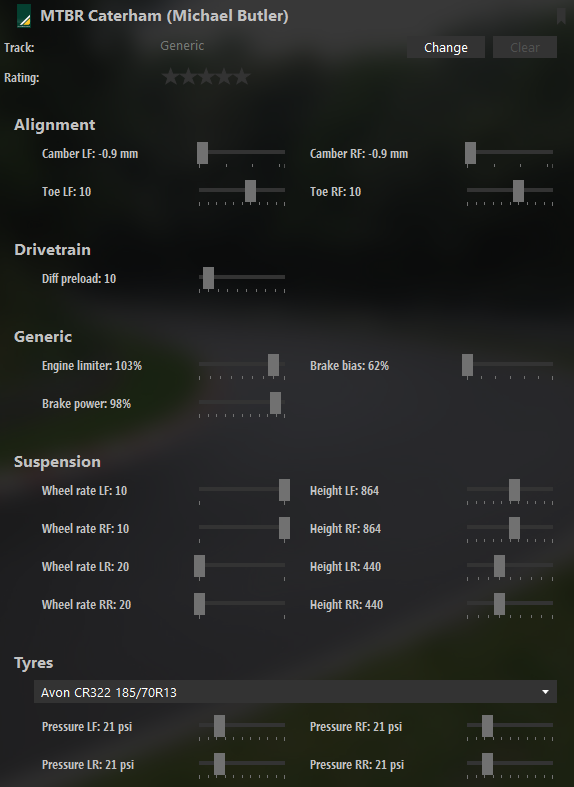 Or general advice for me on the important stuff (tire pressures, suspension, camber/toe)? Thank you kindly. Thank you for sharing, Michael. You were in the Caterham Academy race a few hours ago with me. Congrats on the podium if I remember correctly. Wow, those are some significant changes from the base setup (to my eyes at least). I may be asking a lot (and if so, no worries), but are you willing to explain to me the why behind these modifications? Maybe even with just tire pressure (which I've heard is the first thing to look at setup-wise). What advantage does tire pressures at 21/21 in the Caterham Academy give you over the 20/18 in the base setup for a 20-minute race at RBR? I'd really like to learn about car setups, but the resources I've read and videos I've watched have still left me clueless. Thanks again. I'd really like to learn car setups too, 103 engine limit has to shift a tad early or suffer engine/ transmission damage and I always make that mistake at least 10x a race but, it doesn't slow you down until it turns red, so a little yellow doesn't hurt....we are going to Road America now, so throw that setup away...just kidding....I've run 20/18, 20/19, 20/20, 21/21 on air with pretty much same results so feel free to change what suits you best, i'm still trying to locate more speed in the Caterham myself, have no idea what to change, i try something just a few clicks different every race it seems. 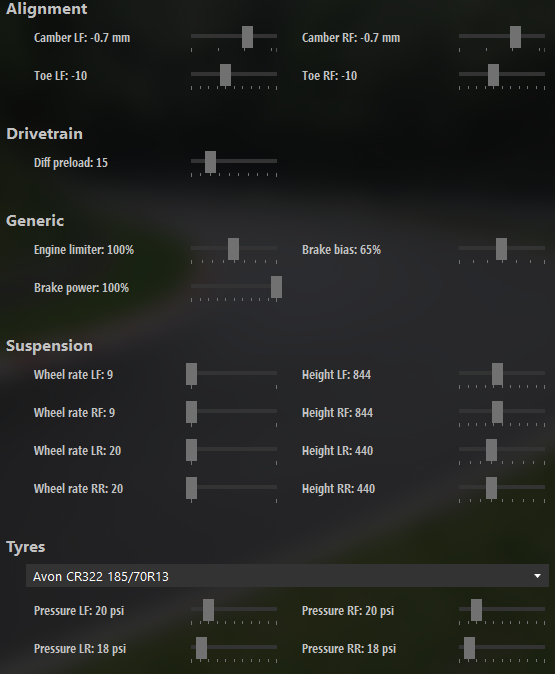 Anybody have a solution for the horrific understeer? (07-09-2018, 11:22 PM)Mike Waltz Wrote: Anybody have a solution for the horrific understeer? Very limited options in setup, shifting down usually jerks the car just enough to get the front end turned, otherwise try not to lose traction whatever gear you choose ....i think it's more of a throttle/brake game than setup. The car has some lift off oversteer so use that to counter the understeer. It is also sluggish to turn in on high speed corners (Even with toe out) so make sure to turn the wheel pretty early. here's my set for brands: https://pastebin.com/aktL22xz I did the setup live on server and no preparing before so I guess it could be a bit better. I guess one could look into 104% engine limiter but never tried. (07-10-2018, 08:14 AM)Stein Waage Wrote: here's my set for brands: https://pastebin.com/aktL22xz I did the setup live on server and no preparing before so I guess it could be a bit better. I'll try this one, thank you, nice lap.....downloaded. Thanks for the setup, I modified the tire pressures just a little for me, took 6th my best finish to date!